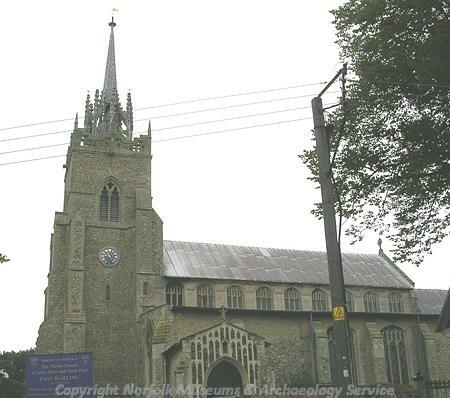 The parish of Harling is situated in the Breckland district of Norfolk on the Norfolk-Suffolk border. It is a few miles northeast of Thetford. Formerly two separate parishes, West and East Harling, the decrease in settlement density in the West Harling led to the joining of the parishes. The modern village of East Harling is situated on the gently sloping southern side of the valley of the River Thet. In the medieval period the villages of West Harling, Harling Thorpe and Middle Harling were also located in the valley. There are five separate Harling entries in the Domesday Book in 1086. Two of these refer to East Harling. The others describe Middle Harling, West Harling and, probably, Harling Thorpe. These other villages disappeared during the post medieval period although archaeological and documentary evidence has been used to identify their likely locations. Two 11th century wills also refer to Harling. The village name comes from Old English and can be translated as ‘place of Herela’s people’. The use of ‘ingas’ within the name may suggest these settlements have a Saxon origin. The de Herling family remained connected with the parish during the medieval period and some of their tombs can be seen in SS Peter and Paul's Church, East Harling (NHER 6049). It was also this family that obtained a market charter for East Harling in 1474 from Edward IV. There were weekly markets and two annual 3-day fairs on St George’s and St Edmund’s Days. Annual sheep sales continued in the village until the early 20th century. The lamb depicted on the village sign illustrates the importance of sheep and their wool to the local economy. The Forestry Commission now own some of the parish of Harling that is managed as part of Thetford Forest conifer plantation. Part of the management of this area involves the archaeological survey of the plantation after cutting of the trees and a Rapid Earthwork Identification Survey has been carried out by Suffolk Archaeology Unit in deforested areas since 1998. This along with fieldwalking and metal detecting carried out by a few local enthusiasts within the area has enabled the recording of human activity in the parish from the very earliest periods. The earliest dated archaeological objects recovered are Palaeolithic flint tools. These include a flint handaxe (NHER 22434) and flakes and a scraper (NHER 6019) found during excavations on Micklemoor Hill. Mesolithic flint tools have also been recorded including a core and blade (NHER 21025) from one site and several blades (NHER 22002) from another. There is evidence for more intense activity during the Neolithic period. Excavation has identified the presence of Late Neolithic pit groups and flint working activity (NHER 6033). On other sites the number of Neolithic worked flints recovered (and the presence of waste flakes and cores) suggests flint tools were made there (NHER 31958, 31959, 31961, and 32144). Single finds of Neolithic axeheads (NHER 6020, 6021 and 6024), scrapers (NHER 6025, 18462 and 25970) and leaf-shaped arrowheads (NHER 6087, 19834 and 40340) are more likely to be casual losses. One unusual Neolithic flint tool (NHER 22435) appears to be an attempt to make an axehead out of a very large waste flake. Several Bronze Age hearths (NHER 6046, 10802 and 10805) were recorded during the early part of the 20th century. These are now thought to be prehistoric burnt mounds. Several possible Bronze Age barrows (NHER 31524 and 33619) were recorded during the Rapid Earthwork Identification Survey in Thetford Forest and others are also known in the parish (NHER 6102 and 6105). These barrows seem to be concentrated northeast of East Harling on higher ground and in the forest itself. Several finds dating to the Beaker period have been recorded. These include a pottery vessel (NHER 6023), part of a dagger or axe (NHER 13817) and several barbed and tanged flint arrowheads (NHER 6022, 6025, 6101 and 12762). 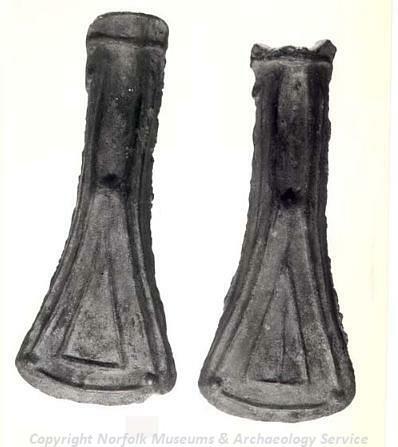 Exciting finds from the Bronze Age include a pair of copper alloy palstave moulds (NHER 21469). Only six other moulds like this are known from Britain. A Bronze Age palstave (NHER 6026) has also been recorded but unfortunately it wasn’t made in the moulds! Copper alloy axeheads or parts of them (NHER 10800, 19569 and 22037) and part of a Bronze Age dirk or rapier (NHER 19508) were also found. Reconstruction of the Iron Age site on Micklemoor Hill. 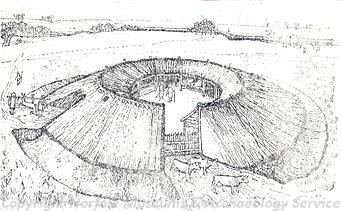 More recent interpretations suggest people lived on Micklemoor Hill in roundhouses rather than open structures as shown here. The Iron Age site on Micklemoor Hill (NHER 6019) was excavated between 1932 and 1953. Two circular Iron Age houses and a rectangular structure were found. An unexcavated probable Iron Age circular enclosure (NHER 6027) has also been identified. The number of pieces of Iron Age pottery (NHER 31959 and 32114) found by fieldwalking at several sites has lead to the suggestion that these might also be areas of Iron Age settlement. Other finds of smaller amounts of pottery (NHER 18454, 31961 and 20039) and single finds such as brooches (NHER 15655 and 6033) confirm the presence of Iron Age activity in the parish. Several 1st century AD brooches (NHER 23841, 25115 and 39270) have also been recovered. The Peddar’s Way (NHER 1289), a Roman road, passes through the parish. Fieldwalking at two sites has identified large amounts of Roman pottery and metal finds. These collections of material suggest these may have been areas of Roman settlement (NHER 6066 and 15613). A second possible Roman road has been identified just south of East Harling (NHER 6116). Apart from these sites there is little other evidence for Roman activity. Roman pottery (NHER 18454, 19701 and 23114) has been found at several sites around the parish as have Roman coins (NHER 6106, 15612 and 16105) and brooches (NHER 16558 and 22773). At one site a Roman brooch was found with metal working debris (NHER 23841). A more unusual object is the ‘bent’ unidentified object (NHER 30347) that is thought to be Roman. The Devil’s Ditch (NHER 6115), an earthwork feature that runs through part of the parish, may be an Early Saxon or Iron Age boundary ditch. Other evidence for Early Saxon activity is sparser. Metal detecting has recovered an Early Saxon sleeve clasp (NHER 24662) and an Early Saxon small-long brooch (NHER 40338). A decorated copper cylinder (NHER 19223) is more difficult to identify. It may be part of an Early Saxon necklace or a bucket pendant. The discovery of a Middle Saxon hoard of coins of the King Beonna (around AD 749 to unknown) led to the excavation of the important Middle Saxon settlement of Middle Harling (NHER 6033). The proximity of Saxon Royal sites to Middle Harling indicates a Royal interest in the Norfolk-Suffolk border area during this period. Other Middle Saxon finds including a mount depicting an animal (NHER 23268), a copper alloy pin (NHER 6084) and a pair of tweezers complete with suspension loop (NHER 37332) have also been recorded. Other Middle Saxon coins (NHER 39270) have also been found away from the hoard site. One of these was a penny of Offa (NHER 31465). Unusually it is also inscribed with the name of Archbishop Aethelheard. An unusually high number of Late Saxon coins (NHER 23310, 11803, 24454 and 39270) have been found in the parish. These include a Scandinavian copy of a coin of Cnut (NHER 19762), a Viking copy made in East Anglia of a coin of Edward the Elder (NHER 23111) and a coin of Harald I (NHER 23505). Harald was the king who was defeated at the Battle of Hastings when he got an arrow in his eye. A Viking style Late Saxon bridle cheek piece (NHER 25116) and a 10th century Borre style brooch (NHER 19699) have also been recorded. Late Saxon pottery (NHER 6028, 6049, 18454 and 19620) has been recovered. At one site the rims of several large cooking pots (NHER 19833) with external sooting were found. 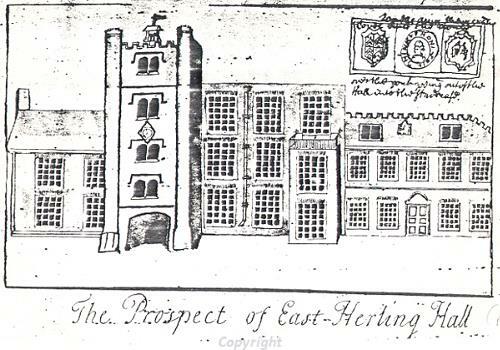 Sketch of East Harling Hall. During the medieval period there were at least four separate settlements in the parish. East Harling still survives today. Its medieval manor (NHER 6029), called Herling’s Manor in old documents, has been identified at the site of Harling Old Hall. SS Peter and Paul's Church, East Harling (NHER 6049) was built around 1300 but much of its current architecture dates to the 14th and 15th centuries including its wonderful 15th century stained glass east window. Two possible medieval structures (NHER 43149) still stand in the village and excavations revealed the floors and hearth of another on Market Street (NHER 36804). Moving west across the parish we come next to the deserted village of Middle Harling (NHER 6033) located close to the drained valley floor. Only a farm and several cottages still survive here. Excavations showed this was a thriving settlement until around the 17th century. An old document possibly records the presence of a mill in 1486. The possible site of Middle Harling Manor has been identified at the site of Stone House Farm (NHER 12478). Middle Harling Church (NHER 21025) was abandoned in the 16th century and demolished in the 18th century. Documentary research suggests that the settlement retained its separate identity after the abandonment of the church but it had disappeared by around 1739. West Harling (NHER 6039) seems to have been quite a large settlement and several concentrations of medieval objects (NHER 17825, 17126 and 11803) have been identified. Historical work has enabled these to be tied to street names recorded in old documents. These street names continued in use until the 18th century. All that now remains of the village are a few former estate cottages and the church (NHER 6051). 17th century Hearth Tax records reveal there were 80 hearths in the village – twenty of these were at Berdewell Hall, the medieval manor (NHER 6031). This building was later replaced by West Harling Hall. All Saints' Church, West Harling (NHER 6051) was built around 1300 and altered in the 14th and 15th centuries. It still stands today although it is now redundant. The most westerly medieval village in the parish was Harling Thorpe (NHER 6087). All that now remains is Thorpe Farm situated on a slight terrace above the valley flood plain. The site of the manor (NHER 6084) has been identified from earthworks of enclosures, medieval ridge and furrow and fishponds. The site is now used as a campsite. The village is recorded as having its own church that may have been located within the earthworks of the deserted medieval village (NHER 6087). Further evidence for medieval settlement has also been recorded. There is a possible defensive medieval moat (NHER 6028) between Middle and West Harling and a second possible moat (NHER 6041) slightly closer to West Harling. Enthusiastic metal detecting in the area has recovered several medieval coins (NHER 19762 and 25117) including one minted in Venice (NHER 14102). A 12th or 13th century gold ring set with a sapphire (NHER 33174) has also been found. The reasons for the decline of the medieval settlements are not completely understood although considerable research has been carried out. The consolidation of the different manors by the 16th century diminished the significance of the separate villages. The management of the merged estate during the 17th century may have been less efficient under the control of Sir John Gawdy. This may have been due to a number of factors such as investment of large quantities of money in the renovation of Berdewell Hall and the large dowry he provided for his daughter Ann. The decreasing profitability of sheep rearing – a key income for the estate would have also contributed. In 1723 the estate was sold out of the family, Berdewell Hall (NHER 6031) was demolished and West Harling Hall was constructed. Land was surrendered to the Lord of the Manor and by 1735 all tenants had been displaced. This signalled the end of substantial settlement in West Harling parish. Life continued in other parts of the parish however. The sites of several post medieval buildings are known from old documents, maps and photographs. The sites of a dovecot (NHER 6048), towermill (NHER 10822), watermill (NHER 13816) and windmill (NHER 13817) have been traced this way. Harling Workhouse (NHER 39399) was replaced by a school building in the 1830s and later residential developments, but some of the original enclosure walls may still survive. The 16th century walled garden (NHER 13896) of Berdewell Hall now contains a poultry farm. There were several post medieval brickworks (NHER 10828 and 15996) within the parish and in the 19th century a telegraph signal station (NHER 13539) on Telegraph Hill. Other structures have survived better and are now protected by English Heritage. Hill Farm (NHER 43145) was built in the late 17th century whilst the aisled barn at Middle Farm (NHER 43148) was constructed in the 18th century. Two pubs in East Harling, the Swan Inn (NHER 43152) and the Nag’s Head (NHER 43154) were also built in the 18th century. The Garden House (NHER 43153), built in the 1780s is unusual because it has a slate roof. Annadale House (NHER 43141), a former rectory, is built of local gault brick. The 19th century Keeper’s Cottage (NHER 42854) interestingly still has a polygonal game larder to the rear. Eastfield House (NHER 43144) is built in an H-shaped plan and is in Jacobean and Gothic styles. Modern archaeological sites and finds are also recorded. The 1909 German field gun (NHER 28914) buried under a house in East Harling surprised builders when they began to dig foundations for a new extension. Nos. 1 to 16 The Crescent (NHER 43140) are clay lump council houses built by Norfolk County Council between 1918 and 1920 as an experiment in cheap housing. West Harling Hall (NHER 6031) was demolished in 1931 and shortly after this the conifer plantation was planted in the west part of the parish. Several World War Two sites are recorded in the database. An aircraft crashed within the parish in the 1940s (NHER 21591). There is a unique World War Two defence post (NHER 32708) between the River Thet and the River Ouse. A more common World War Two pillbox (NHER 32709) has also been recorded. Megan Dennis (NLA), 14 February 2006.
http://www.norfolkchurches.co.uk/eastharling/eastharling.htm. Accessed: 14 February 2006.
http://www.norfolkmills.co.uk/Watermills/east-harling.html. Accessed: 14 February 2006.
http://www.norfolkmills.co.uk/Windmills/east-harling-towermill.html. Accessed: 14 February 2006.
http://www.countrysideaccess.norfolk.gov.uk/walk-72.asp?id=72. Accessed: 14 February 2006.